It would be difficult to find a better example of disdain38 and lack of appreciation for words than that remarkable use of the non-word39 of verbage, so close to garbage40, so far from language. Did she mean verbiage, but pronounce it badly? 1. verbiage: speech or writing that has many unnecessary words in it (冗词，废话). 2. hate words: intense hostility spoken often in anger or derision (攻击性词汇). 3. presidential candidate. a person selected by a political party to compete for the presidency of a country (总统候选人). 4. denounced: publicly accuse or proclaim a person or thing to be inferior or unacceptable (谴责，痛斥). 5. privileged wordsmith: a person having an advantage by means of using words well (有特权的辞匠). 6. authored: written one or several books (写作，创作). 7. extremist: A person who takes a position either far to the negative, or far positive to the average or normal position on an issue (极端主义者). 8. elitist: a person who enjoys advantage or favor over others because of superior education, training, or superior knowledge (杰出人物). 9. critic: a person who finds flaws or errors in ideas, individuals, information, etc. (批评家). 10. conservatives: people who favor traditional ideas as opposed to liberal or new ideas, especially in political or economic issues (保守派). 11. disdained: thought that someone or something was not important and did not deserve any respect (鄙视，蔑视). 12. residual Puritanism: a behavior of strictness learned and retained from a religious background (残存的清教徒行为). Puritans were a group of persons of very strict religious beliefs who came from Europe and settled in what is now the New England area of the U.S.
13. anti-intellectualism: a position opposing or hostile to intellectual ideas, concepts, or approaches to problem solving (反理智主义). 14. vision: a way of seeing or knowing something usually based on belief or knowledge (眼光，看法). 15. get in the way of. interfere with or obstruct a plan or system of someone or something else (干涉，干预). 16. humility: a quality or state of being humble (谦逊，谦恭). 18. “a pig with lipstick”: a metaphor meaning that for a pig, lipstick is just an added item that has no legitimate place or function (涂口红的猪，一个隐喻，表示对于猪来说涂上口红是不合理没有用的). This phrase is commonly used to describe an idea or concept which is inappropriate or foolish by something it is associated with. 19. implicit: suggested or understood without being stated directly (暗示的). 20. slippery fluid: a metaphor meaning that language is slick, hard to get hold of, and easily dropped or lost from one’s grip or possession (柔滑的液体，该隐喻表示语言是柔滑的，很难抓得住，抓住了也很容易失去). 21. decry: make strong opposition to something, to denounce an idea or concept, person or activity, etc. (公开反对，谴责). 22. facility: the easy or evident ability or skill in the use of something or for some task (天赋，技能). 23. amoral manipulations: techniques without any moral sensibility or basis (是非不分的操纵，控制). 25. “Original Maverick”: the first or unique individual who is intentionally different from others (首位特立独行的人). In the TV ads, the maverick is shown as a brave, cowboy type. 26. logo: A letter, symbol or identifying sign which represents a company, country, person, etc. (标识，标志). 27. reassuring: giving or restoring confidence or comfort to others (令人安心的，安慰的). 28. “Serving Americans of discernment since 1951”: a typical advertising style statement which intends to capture the imagination of the public (服务于有鉴赏能力的美国人达半个多世纪之久，这是典型的广告风格的语句，其目的在于抓住公众的想象力). 29. eccentric: off centered, unusual, or out of the ordinary in behavior or appearance (怪异的，反常的). 30. belatedly: after the fact, or later than expected (迟，太迟). 31. diplomas: documents showing evidence of completion of a given educational level, such as BA, MS, PhD etc. (毕业文凭，学位证书). Here the speaker is attempting to say that his opponent is attempting to show superiority by use of his educational achievements. 32. redistribution of wealth: the process of rearranging, or directing a given set of assets or wealth in a different way (财富重新分配). Some politicians think of this as “taking from the rich and giving to the poor,” but it may mean simply restructuring tax levels based on wages or wealth so that there is a more equitable sharing in a society or nation. 33. espoused: offered or supported by an individual, group, etc. Given credit for an idea or technique (支持，拥护). 34. “be-all-end-all”: the ultimate or best final solution to a problem or task (宗旨，终极目的). 35. sound: healthy or robust (健康的，良好的). In this case, it refers to a strong, secure economic basis. 36. workforce: the entire or collective employed individuals in an area or nation (劳动人口，劳动大军). 37. ingenuity: the ability to arrive at unique and positive ideas or solutions to a problem which exists (足智多谋). 38. disdain: scorn or dislike of something or someone, or a policy or idea (鄙视，蔑视). 39. non-word: an unaccepted word, often a mistake of usage (错词). 40. garbage: the waste or spoiled food items which are discarded (垃圾). Today Don put together some more bookshelves here in our office. We keep accumulating1 more books than we get rid of2 so always need more space for them. Why so many books? I guess it’s because we like to read. We check out3 some books from the college library and others from the public library. When new books come out by writers we particularly4 enjoy, we sometimes don’t want to wait until we can get them from the library because we know a book we see advertised5 probably won’t be ordered for one of those libraries soon, if at all. How do we know about the books we want? I read the BOOK REVIEW section of the NEW YORK TIMES6. It is published each week end and contains both book reviews and book ads.7. It also lists the “best sellers8,” those books of which the most copies have been sold that week. There is a fiction9 list and a non-fiction list. Many authors which we like are on the fiction best selling list just as soon as they come out, so I look for those names. I know I will like anything written by the Chinese American writer Amy Tan10 and the Scottish writer Alexander McCall Smith11. When their new books come out, Don and I don’t want to wait to check them out; we usually buy them. That is when we use the book store gift certificates12 we receive. This week’s BOOK REVIEW listed a new book about China. Kim has gone to Des Moines for the week end and there are several large book stores there, so I asked her to purchase it, using one of our gift certificates. I also belong to the book shopping club13 of one of the book stores so get 10% off each book I purchase. In addition, that store sends out coupons14 giving me an extra 15% off. Therefore, we can get a hard copy15 of a new book for the price of a paper back16 copy which will come out at a later time, if at all. If a book doesn’t sell enough copies in the hard-back edition, it won’t come out in paper back. Don and I read books by our favorite authors out loud to one another. It is a pleasure for both of us. This afternoon we started reading The Corpse Walker17 by Liao Yiwu18 which is about Chinese people, a compilation19 of 27 oral histories20 from many different professions and walks of life21; from Erhu player22 to grave robber23. So far, it’s quite interesting. Kim bought it for us. We enjoy learning whatever we can about China, an extremely fascinating24 country to us. 1. accumulating: gradually getting more and more possessions, knowledge etc. over a period of time (积累). 2. get rid of: give away something which is no longer wanted (丢弃，处理掉). 3. check out: borrow a book from a library (从图书馆借书). 4. particularly: especially, more than usual or more than others (特别，尤其). 6. BOOK REVIEW section of the NEW YORK TIMES: a weekly section of the newspaper in which new books are discussed (纽约时报的书评专栏，该报每周出一期这样的专栏对新书进行讲评). 7. book ads. : advertisements for books (书籍广告). 9. fiction: books and stories about imaginary people and events (小说，故事). 10. Amy Tan: a very popular Chinese-American book writer in the U.S. (谭恩美，一位很受欢迎的华裔作家). 11. Alexander McCall Smith: a writer/lawyer who writes sympathetically about the country and people of Botswana in Africa (亚历山大•麦考尔•史密斯，作家兼律师，其著作对非洲的博茨瓦纳人民和国家表现出深深的同情). 12. gift certificates: coupons or cards paid for by one person who then gives them as gifts to be used in stores (礼券，可以购买的票证，然后送给他人，可以在商店使用). 13. book shopping club: a special purpose for which a small fee is paid each year, and which offers special benefits for the club member (购书俱乐部，俱乐部成员可以得到专门的优惠，但每年要为此付出数额不大的会费). 14. coupons: a small piece of printed paper that gives you the right to pay less for something or get something free (优惠卷). 15. hard-copy books: a book with a heavy binding and cover (精装书). 16. paper back: a book with a cover made of thick paper (平装书，简装书). 18. Liao Yiwu: a native contemporary Chinese poet, novelist and screen writer. His articles and translations have occurred in many journals (廖以武，中国当代诗人、小说家和剧作家。他的文章和翻译作品由很多期刊刊登过). 19. compilation: a grouping of writings; in this case, oral histories, bound together (汇编，集，文中系口传历史故事集). 20. oral histories: vocal recounting of lives as experienced by various individuals (口传历史故事). 21. walks of life: vocations, professions, etc. (各行各业). 22. Erhu player: a musician who plays the traditional Chinese instrument known as the erhu (二胡演奏者). 23. Grave Robber: a person who steals items from burial plots or graves (盗墓贼). Central College is the name most often used for the liberal arts college1 which is found in Pella, Iowa in the United States. Originally it was chartered2 as Central University of Iowa3 in 1853, and it became Central College when the Central Board of Trustees4 requested the name be changed in the early 1990s. Since the time of its existence5, less knowledgeable people have referred to it as Pella College and several other unofficial names, apparently reflecting the bias6 of the persons giving the name. When chartered, the university included a College Preparatory School7, a Liberal Arts College8 and a Conservatory of Music9. Dr. Hendrik Peter Scholte, the leader of a group of dissident10 immigrants11 from the Netherlands, offered the land to the Baptist Church12 which already existed in the area. From the beginning, the charter for Central was educationally liberal13 and an inclusive14 one for the mid-19th century. The charter stated that there was to be no bias15 in selecting faculty members or students on the basis of “race, religion, gender or country of origin16.” Any student meeting the “educational and moral” requirements17 for entry was to be admitted18. Central was also unusual in that from the beginning it had about half women and half men at a time when college education for women in the U.S. was not common. About half of the faculty were also female. Dr. Scholte, “the dominie19” was himself a former Professor of Philosophy and Religion at the University of Utrecht, in the Netherlands. He had been persecuted20 and imprisoned for his rejection21 of some of the religious teachings22 of the State Church in Holland, and he led a group of enlightened followers23 to a holding of property which he had purchased for them in Iowa. They chose the city’s founding name Pella24 after the classical Greek “City of Refuge25,” in Macedonia26, a place of refuge, for citizens who were fleeing their tormentors27. Among the hundred or so followers were several professional families, including doctors, artists, writers, businessmen, lawyers, musicians, teachers etc. In Pella they avoided any denominational ties28 to any existing church, and in chartering the college, they insisted on the same standards29. Central continued under ownership of the Baptist Church until 1918 when it was given over to the (Dutch) Reformed Church30 in America for financial reasons. It remained a small teaching institution—under 200 students—until after World War II when returning veterans31, along with the major efforts and new programs of administrative leaders, played a role in its growth, both financially and academically32. Further qualitative and quantitative growth33 progressed steadily; currently with an enrollment34 of about 1,700 students and a faculty of more than 100 full time teachers. Since the 1960s Central College has become known for its International Studies Programs35 (now in France, Austria, Spain, the Netherlands, England, Wales, Yucatan, China and Kenya). About 60% of students graduating have had a foreign study experience. Other major areas of strength include; Natural Sciences, English & Linguistics, Modern Languages, Psychology, Sociology & Anthropology36, Business & Economics, Math & Computer Sciences, Philosophy & Religion, Education, Physical Education and Exercise Science. 1. Central College is the name most often used for the liberal arts college: an undergraduate college intended to provide for and develop the general intellectual capacities such as reasoning and judgment as opposed to professional or vocational skills (中央学院是一所本科人文学院，旨在培养全面的知识和能力，如推理和判断，而不是培养职业技能。). 2. chartered: approved by granting of a charter from the state which permit’s a college to offer those study areas and related academic work as stated in the charter (特许设立，须经州政府批准、授意其章程，该章程明确规定该学校可以提供哪些学习领域和相关课程). 3. Central University of Iowa: the original name at the time of the granting of a charter to Central College (爱荷华中央大学，即中央学院特许成立时的校名). 4. Board of Trustees: a governing board elected or appointed to direct the policies of an educational institution (大学董事会，经选举或任命产生，是指导学校政策的管理机构). 5. Since the time of its existence: since the period of time that something has occurred (自从它存在的那天起). 6. reflecting the bias: showing the misunderstanding or orientation of the persons involved (反映了有关人员的偏见). 7. College Preparatory School: a high school which prepares a person to enter college (大学预备学校). At that time both Latin and Greek languages were usually required for entrance to college, as was true in European universities. 8. Liberal Arts College: a baccalaureate level 4-year college (一所本科四年制的人文学院). 9. Conservatory of Music: a school of music, which at that time was not considered to be part of the Liberal Arts College (音乐学院，当时并没把它当作人文学院的一部分). 11. immigrants: people coming from another country (移民). 14. inclusive: intended for all types of people (有意包括各种人的). 15. bias: prejudice or favoritism shown for some principle or idea (偏见). 16. country of origin: the nation in which a person was born (出生国家). 18. admitted: allowed to attend or take part in (允许入学). 19. dominie: the Dutch term for pastor or minister of a church (牧师，荷兰语). 20. persecuted: treated cruelly or unfairly (受迫害). 21. rejection: refusal to accept a given idea or concept (拒绝). 22. religious teachings: beliefs taught by a religious group which are expected to be accepted by members (宗教信仰). 24. Pella: the name of a city in Iowa, taking its name from a city in Classical Greek Macedonia (爱荷华州的一个城市名，该名取之于古希腊的一个城市名). It was a place of refuge for people fleeing from persecution. 25. refuge: safety, shelter or protection from danger or distress (庇护所，避难处). 26. Macedonia: an ancient country in the northern part of ancient Greece (马其顿，曾经是一个古老的国家，位于古希腊的北部). 27. tormentors: people who deliberately treat someone cruelly by annoying them or hurting them (摧残、折磨他人者). 31. veterans: persons who have served in the armed forces of a country (老兵). 32. academically: in terms of curriculum or course of studies (在学习课程方面). 34. enrollment: official registration in a program or course of studies (招生). 39. intramural sports: athletic activities within the college, not between colleges (校内的运动). I recently received information about one of my former students. It reminded me once again that one might easily overlook1 one of the most rewarding2 aspects3 of teaching as a career. The most amazing thing to me is that I did not anticipate this when I began my career in teaching and research4 in biological science. I did recognize that I would be rewarded5 both for my research efforts and for teaching, but I did not know how pleasant it would be to hear of and share the joy of one’s former students in their professional lives in research and teaching in the sciences. This news reminds me that one of the greatest rewards of teaching is to learn of the subsequent6 professional success of one’s former students. Pam Soltis, a former student at Central College about thirty years ago, just received recognition7 at the national level for the research which she and her husband, Doug Soltis, have just published in the Proceedings of the National Academy of Sciences8. This is indeed a high honor, because PNAS publications are by invitation only9, upon the recommendation10 of a member of the National Academy of Science in the U.S, an elite group11 of scientists. Pam and Doug’s research reveals that diversity12 in plants occurred in a relatively short13 time of about 5 million years. This “Big Bang14” is an important fact. Flowering plants are known to have existed for more than 130 million years. The Soltis’ work is based on gene analysis15 in the DNA of chloroplasts16, the small objects in green plants which allow them to use light to produce sugars as a result of photosynthesis17. I know that at least twenty of my former students have achieved similar recognition in quite a diverse number of areas of science, and I realize that this is a greater reward for me than the financial compensation18 and the public recognition by my peers19 and my administrators. I suspect20 that there are many others as well, who I am not aware of, who have also achieved success in their professions, both in the sciences and in other fields. 1. overlook: fail to notice something, or not see how important it is (忽视). 2. rewarding: giving satisfaction, pleasure, or profit (值得的，有意义的，有回报的). 3. aspects: various parts of the whole; different phases of something (方面). 4. research: the process of collecting information and of looking for and finding the cause of something, or the nature of something (研究). 6. subsequent: following after something else; coming next in time or place (随后的). 7. recognition: public respect and thanks for someone’s work or achievements (表扬，表彰). 8. Proceedings of the National Academy of Sciences: the journal published by the National Academy of Science; probably the most prestigious journal in the United States for reports of significant research (国家科学院公报). 10. recommendation: a supportive letter written to acknowledge the value of a person or piece of research, work, etc. (推荐信). 11. elite group: a group of the highest stature, the best of its kind (精英人群). 12. diversity: the fact that very different people or things exist within a group or place (多样性). 13. relatively: in comparison with a similar thing, person, group etc. (相比较地). 14. “Big Bang”: an explosive development, very rapid or fast, meaning that it occurred in a rather short time (爆炸式的快速发展，指在短时间内发生的变化). 15. gene analysis: study of the genetic makeup of a living organism; in this case, the genetic makeup of DNA found in the chloroplasts of a plant cell (基因分析，对有机物的基因组成的研究，此处指的是在植物细胞的叶绿体中发现的脱氧核糖核酸的基因组成). 16. chloroplasts: the elliptical small bodies found within plant cells which contain the pigment chlorophyll, and which permit plants to carry out photosynthesis (叶绿体，系植物细胞内的很小的椭圆形物体，它含有叶绿素并能使植物进行光合作用). 18. compensation: payment for work done (补偿). 19. peers: people who belong to the same social or professional group as another person (同辈，同事，同等地位的人). 20. suspect: think or believe that something is so (觉得……属实). 21. vocation: a specific profession or type of work which one pursues (工作，职业). One of the enjoyable events of Homecoming2 at Central College in Pella, Iowa, is the Lemming Race. This completely frivolous3 event for undergraduate4 students was started by Central College students, Larry Happel, Class of 1977, and his friend, Jack Grubaugh, who was elected by students as Grand Lemming5 of the first year’s festivities6. We knew these students well, and both had a good sense of humor7. Happel is now Associate Director of Sports Information at Central8, and Grubaugh, who was my advisee as a Biology major9, has a PhD10 in Biology and does research with fish and clams11 of the Mississippi River habitats12. Lemmings are small rodents13 found in the far Northern Hemisphere14, and as part of their natural means of population control15, the lemmings faithfully16 follow the leader of the group, and the leader and followers will run and jump off a high cliff17, falling to their death in the ocean water below. The annual Lemming Race at Central College commemorates18 this event, and initially19 students raced about 100 yards from the area near Geisler Library20, down Peace Mall21 to the pond22 in the center of campus, where the pairs of runners, one leg of each bound to the other by a rope, ran and jumped into the water to the accompaniment23 of laughter by the crowd of students and alumni spectators24 gathered near the pond. There were initially student teams of males and females, all dressed outrageously25 in swim suits or colorful old clothing. Now, the legs are no longer tied, and even some faculty26 may join many students as they race with the “lemmings” and add to the hilarity27 as they splash into the pond28, throwing water on each other and on the spectators near the pond. There are about as many cameras as spectators, taking photos of the event, and all are laughing and shouting as the runners flail29 about in the water. Many of the contestants30 and the crowd wear special Lemming Day shirts31 on the day of the race, and all welcome it as a means of “letting off steam32” in a harmless tradition33 unique34 to Central College Homecoming week end. Grand Lemming this year was David Trotter, a senior Environmental Science major35, who defeated ten other students for the honor of leading the Lemming Race and the associated celebrations of Lemming Day. David threw caution to the wind, dressed in a costume called “early ‘90s Epic Rocky Balboa36,” and said, “If I had the power, I’d dismiss classes all day on the day of the Lemming Race.” The Grand Lemming also thanked Central College President, David Roe, and others who permit this unique event to be a part of Homecoming. 1. Lemming Race: a competitive event in which students dress in unusual costumes, run to the campus pond and jump into the water (旅鼠竞赛，是一项比赛，比赛中学生们穿着奇怪的服装，向校园里的池塘跑去，并跳入水中). 5. Grand Lemming: or “King of the Lemmings,” name for the leader, who rules over the celebrations on Lemming Races (大旅鼠，又称“旅鼠王”，是旅鼠竞赛庆祝活动的领导). 9. festivities: celebrations or colorful activities; joyful events (庆祝活动). 18. commemorates: does something in memory or in honor of a person or thing. ; to serve as a memorial (纪念). 20. Geisler Library: a large building west of the Central campus area which houses the books and periodicals held by Central College (中央学院的图书馆，位于该校区的西部). 21. Peace Mall: the name of the pedestrian walkway through the Central College campus (穿过中央学院校区的一条步行通道). Once was a street, but was closed to traffic to become part of the interior campus. 24. spectators: people watching an event of some sort (观众). 25. outrageously: unusually different (惊人地不同). 29. flail: movement of the arms and legs in an uncoordinated activity; uncontrolled movement (手臂和腿脚像连枷一样挥动). 30. contestants: people involved in a contest; in this case the Lemming Race (参加旅鼠竞赛的人). 31. Lemming Day shirts: shirts that have been designed specifically to be worn at the Lemming Day activities (专门为旅鼠竞赛日设计穿的衬衣). 34. unique: singular; not found elsewhere (独一无二的). 35. environmental science major: a course of study dealing with the physical and biological aspects of the surround world. 36. “threw caution to the wind” idiom. without restraint; having no care for the moment. 37. in a costume called “early ‘90s Epic Rocky Balboa”；in the style common to the movie hero, Rocky Balboa popular in the early 1990s (穿着90年代早期的电影“洛基：勇者无惧”风格的服装). Each Monday afternoon during the school year1 Don and I go to Jefferson Elementary School2 here in Pella3 to read with a 4th grade student. 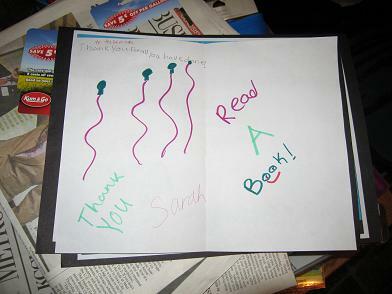 This is the third year we have been involved4 in the “literacy” program5 and we enjoy it very much. We have worked with the same 4th grade teacher6 each year. She chooses a student for each of us to work with. It is always a student who she feels can profit7 from reading out-loud8 with an adult9 discussing what is being read. This year I am working with a little girl named Shelby. She reads pretty well, but she also seems to have need of attention10 of an adult to read with her. Don works with a little boy who needs to pay more attention to his comprehension11. Each year we’ve been happy to watch our students develop12 and improve in various ways. When Shelby was assigned13 to me last fall, it was obvious that she really wasn’t pleased that her teacher had placed us together14. It was obvious that she’s a shy15 person and she didn’t want to have to be with a stranger16. However, we soon became friends, and when Don and I missed several weeks when we went to China, she was quite pleased when I returned to read with her again. Shelby reads well and has an expressive17 voice. Sometimes I wonder how well she understands a certain word so I’ll ask her if she really knows what it means and we’ll discuss it18. Today one such word was “cinch,” meaning to tighten a saddle on a horse.19 She knew its meaning and said she knew it because she has ridden a horse20 and put a saddle on it. I’m often surprised at21 some of the experiences my students have had. Our students are allowed to choose the book they will read with us. I feel that Shelby chooses very good books, much better than the little girl I read with last year did22. Today Don’s student, J.D., finished23 his book and then took a test24 on it. Don says J.D. does well on his tests. I haven’t given one25 to Shelby yet as she hasn’t finished a book on Monday while I’m there. When school ends26 the first week in June, our reading program will end also. However, Don and I will have good memories27 of the year. We always do.28 When our children were young, we read out loud to them every night. Our Jefferson School reading program seems to be a normal extension29 of what we were doing then. We hope to continue being helpers again next year. 1. school year: an academic year, usually September through May or June in the U.S. (学年，在美国通常为九月至第二年的五、六月). 2. Jefferson Elementary School: a building in which children attend kindergarten through 5th grade classes (杰弗森小学，包含幼儿园大班到小学五年级). This school is named after Thomas Jefferson, one of our early U.S. presidents. Many schools in the U.S. are named after famous presidents such as Washington, Lincoln, etc. 4. have been involved in…: have been a part of…; have taken part in some activity (参与了). 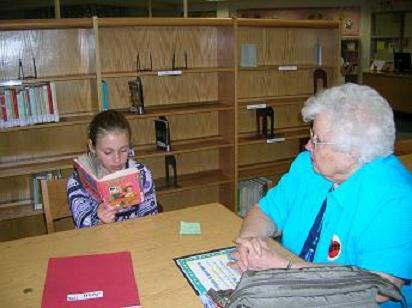 5. literacy program: a reading program designed to encourage students to become better readers (提高阅读能力项目). Literacy refers to ability to read and write a language. Many schools in the U.S. now have such programs, and using volunteers such as adults, college students, etc. 6. 4th grade teacher: a person who is responsible for teaching students at the 4th grade level of elementary school (四年级负责老师). The students are about 9 years old. 7. profit (from…): gain, or become better (by doing a given exercise or lessons) (获益). 8. read out-loud: read and say what is written at a volume so that it can be heard easily, not silent reading (大声读出来以便别人能够很容易听到). 9. adult: a person who has reached the legal age to vote in a given country or state ( 成人). In most of the U.S. this is the age of 21 years. However, some people think that adulthood begins at the age of 18, when one is allowed to drink alcoholic beverages in some states, and when one may be drafted into the military service. 10. attention: the interest that people show in someone or something (关注). 11. comprehension: the ability to understand something about what is being said or discussed about a topic, person or thing (理解力). 12. develop: make progress or mature in some activity or growth (发展、成长). 13. was assigned to me: was given to me (to do or complete something for some reason) (分配给我). 15. shy: timid, nervous about meeting and speaking to other people, especially people one doesn’t know (胆小、害羞). 16. stranger: a person who is not known to one, or with whom one is not acquainted (陌生人). 17.expressive: showing meaning or effective in exhibiting feelings (有表达力的). 18. Sometimes I wonder how well she understands a certain word so I’ll ask her if she really knows what it means and we’ll discuss it: 有时候我想知道她对某一个词理解得怎么样，我就问她是否知道这个词的意思，于是我们就一起讨论这个词. 19. Today one such word was “cinch,” meaning to tighten a saddle on a horse: 今天就有这样一个字，是”cinch”，意思是把马鞍收紧。A saddle is a piece of equipment, usually leather, placed as a seat on the back of an animal, such as a horse, donkey, mule etc. 20. has ridden a horse: has sat, guided and traveled on a horse (曾经骑过马). 21. surprised at…: having the feeling you have when something unexpected or unusual happens (对……感到惊奇). 24. took a test: took an exam given to someone or something to detect performance level (考试了). 26. ends: terminates a designated period of time (结束). 28. We always do: We always have good memories. 29. extension: a continuation of an action, or period of activity, or time (延伸). You are currently browsing the archives for the Education and Learning category.